Cover Design by Pink Ink Designs. As the youngest member of the Sutter family, Cayden was always known as ‘the smart one’. Meeting women and playing football might have been his family’s thing, but not his. He was on track to graduate and pursue a degree in physics until he met his nemesis, math. Addison Porter is a math genius and studies in the same spot of the library every day, that is until one day when her seat is taken. Never being one to back down, she orders the squatter to move. When he offers to share the spot instead, she reluctantly agrees. After noticing her extensive text book collection in mathematics, Cayden asks for help. What started out as a simple request soon turns into so much more as Addison hides her identity. Not knowing anything about the woman, Cayden goes on a mission to find her, one that lasts for over a year. What happens when he finds her? Does she have a reason to remain anonymous? Has Cayden finally met the one who will change his plan for the future? 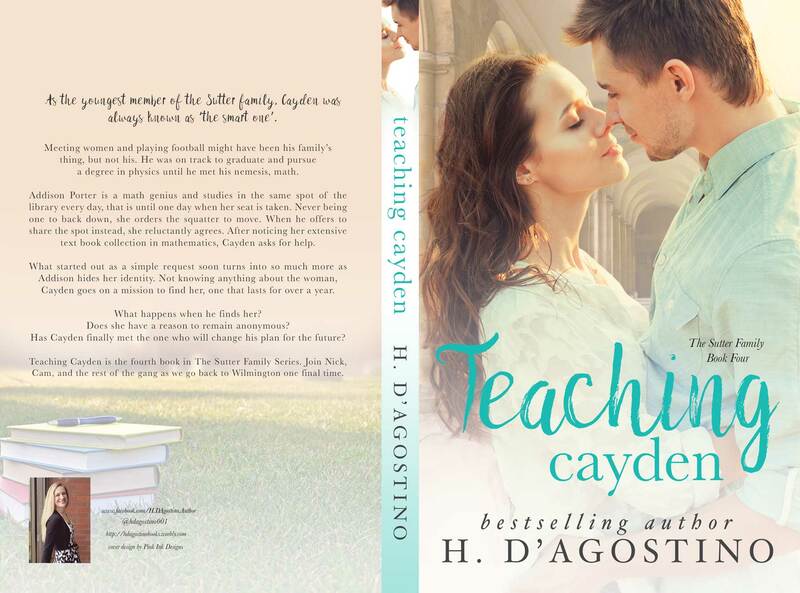 Teaching Cayden is the fourth book in The Sutter Family Series. Join Nick, Cam, and the rest of the gang as we go back to Wilmington one final time.